The Sandcastle is nestled in the charming, Gulf-front community of Destin Pointe, offering 2 community pools, tennis courts, private beach access, community trolley to the beach access points, and 24 hour security! The Sandcastle is located approximately 200 steps from the white sands and emerald waters of the Gulf, with Gulf views from the 2nd floor bedrooms and Master balcony. 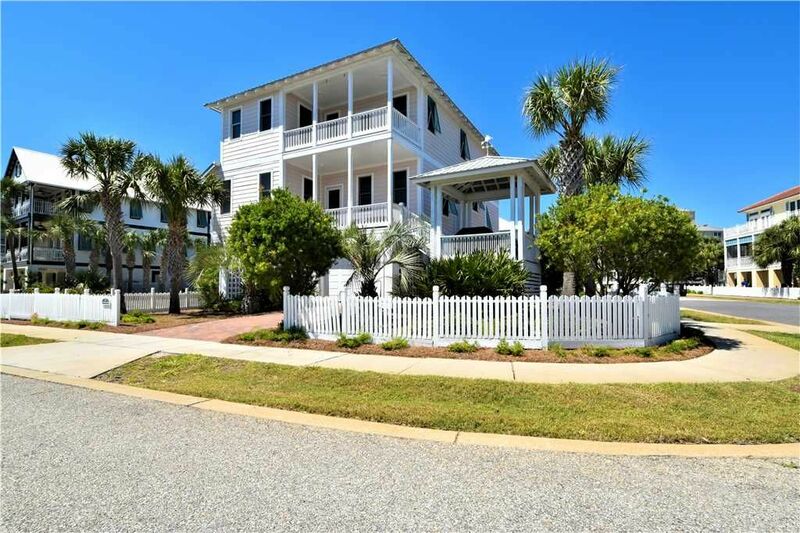 The Sandcastle includes updated features and includes luxuries such as hardwood floors throughout the entire house, all flat-screen TVs, and beautifully tiled bathrooms. Tastefully and thoughtfully arranged, The Sandcastle will provide the perfect beach home for your family for years to come! The first level of this vacation home has a 3-car garage, and there’s still room enough for 2 additional cars in the driveway. The garage features storage space for all of your beach gear! You’ll find comfortable furniture in the living area where you can relax and enjoy the flat screen TV or sit back with some soothing music playing on the stereo system. The well-equipped kitchen features stainless steel appliances and granite countertops with seating for three people on the oversized kitchen island. The kitchen comes fully-equipped with all the cookware and dishware you would need to create memorable meals for the whole family while on vacation. The dining area has seating for eight people comfortably and there is an additional breakfast table with seating for four. The main balcony leads down to a separate covered grilling deck. Two Guest bedrooms are also located on this level. A Queen bed and flat-screen TV create a comfortable escape in the first Guest bedroom. Two Twin daybeds with twin trundles in the second Guest bedroom give lots of lounging room for guests while enjoying a flat screen TV with a Blu-ray player. The hall bathroom is conveniently located to the living area and the Guest bedrooms and features a walk-in shower. Luxury and comfort are waiting in your 3rd floor Master bedroom! Designer furnishings, a King sleigh bed, 50” flat-screen TV, and private Master balcony with a Gulf view are combined with the sanctuary of the Master bathroom to create an atmosphere of tranquility. Unwind in the jetted tub, or wash away the day in the separate, tiled shower. A double vanity gives you plenty of room to get ready for your beach adventures! An additional spacious Guest bedroom contains a King bed and flat-screen TV. It also offers a private bathroom with an oversized tiled shower granite sink top. An additional Guest bedroom is located on this level, with a Queen bed, flat-screen TV, and private bathroom with a walk-in shower. Additional seating for 3 at breakfast bar plus 4 more at breakfast nook. We had a great time, very happy with the space of this home and everything was clean and very nice! Short walk to the beautiful beach or heated pool and hot tub (which came in very handy on cooler days). Would definitely come back to this place! Close to the ocean and the bay and right between two pools. Was a great house. Great House for Multiple Families! Loved the close proximity to the beach and pool! Large bedrooms with plenty of space for multiple families to stay with several kids. The most frustrating aspect of the house was the lack of hooks, clothesline to hang swimsuits and towels to allow them to dry. Would love to have had hooks on the back of bathroom doors or more towel racks in the bathrooms as well as clothes lines in the garage area. But overall a great place to stay! We loved our stay!!! Beautiful home, beautiful neighborhood, beautiful beach! We really enjoyed our recent stay! Home was clean and spacious! Felt safe being in a gated community! Good location to the beach and only steps away from the community pool! Thank you for the amazing spring break! We will definitely stay here again! The Sandcastle was an amazing beach house. Very clean and spacious. I liked that the upstairs bedrooms had their own bathrooms. It’s a good house for two families due to bedrooms being on both levels of the house. The walk to the beach and pools is easy. The location of the neighborhood is nice too. You can play on the beach, snorkel And fish at the jetty, etc. plus it’s close to restaurants and shops. My only complaints are minor. It took a long time to figure out the living room tv with several remotes, so a quick set of directions would be great. There were also a few minor maintenance issues. We didn’t call about them because I didn’t want to spend my vacation waiting on workers to come to the house. I’d definitely stay at this house again.